Please download (Ungaria game) and enjoy. Ungaria is a challenging game of strategy, skill and a bit of luck, adapted from ancient traditions of the Magyar people. Requiring concentration and speed, it is a wonderful pastime, that can be played with various levels of complexity and different time demands, allowing the players to keep a record of their evolution. Points are awarded for any domino placed on the board.The higher the number of edge fits and/or the faster you play and/or the more dominoes already on board,the higher the points. Games configured with smaller boards and/or with more colors reward more points. 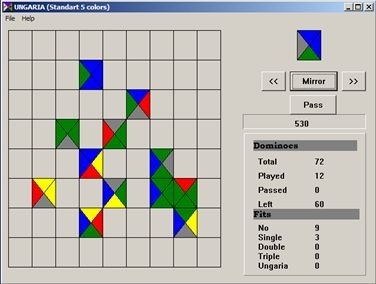 The new one version by Argos Gameware (1995)Links: http://www.gamespot.com/pc/puzzle/ungaria/review.htmlhttp://www.ag.ru/games/ungariaThe gameplay is as follows: You begin with an empty grid and are dealt a finite series of colored squares. Each square is divided into four sections, each of which can be one of four colors. The object of the game is to fill the empty grid by placing the squares so that their bordering colors match. The squares can be rotated with the click of a mouse button or “mirrored” by pushing a button up at the top of the screen. More points are awarded if you match two or more sides of a square to a group of squares. 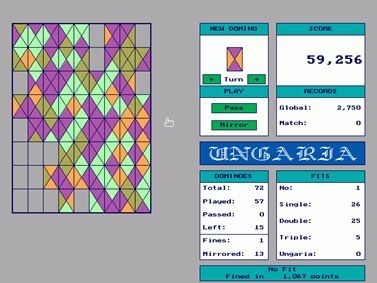 And if you place a square and match four sides — the crowning achievement — you accomplish “ungaria” and receive the maximum points. A “bonus time” counter ticks away relentlessly at the side of the screen, and the less time you take to make a move, the more points you get. What happens if your time runs out? Absolutely nothing! If you’re stuck on a move, go ahead and grab dinner and a movie because you’ve got plenty of time. Of course, there’s always the option of discarding the unusable piece. 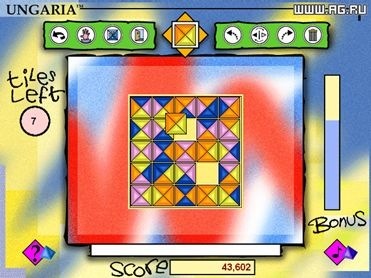 Other game options include increasing the grid size and increasing the number of colors available to each square.